The Air Force manages its enlisted promotions differently than the other services. The Air Force first determines the overall promotion-rate (Air Force Wide) for the promotion cycle, by forecasting how many slots will be available. It then takes this rate and applies it to all of the Air Force jobs (almost*) equally. For example, let's say the Air Force determines (Air Force Wide) that it will be promoting 20 percent of all eligible Staff Sergeants (E-5) to the rank of Technical Sergeant (E-6) for the next promotion cycle. 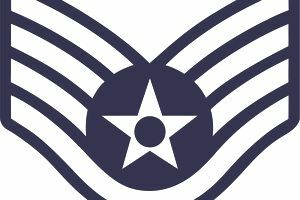 Each and every career field (job) will promote 20 percent of their eligible Staff Sergeants to Technical Sergeant, regardless of whether or not the job is over-manned or undermanned. (1) The Air Force rounds the numbers *up* for each job. For example, if the overall promotion-rate for the cycle is 10 percent, and there are 100 people eligible in "Job A," then 10 people will be promoted (10 percent). However, what if there were 113 people eligible? 10 percent of 113 is 11.3. You can't promote one-third of a person, so in this case, the Air Force would round it up and promote 12 people. That would result in a promotion rate in that job of 10.6 percent, instead of 10 percent. If there was only one person eligible for promotion in that AFSC (Job), he/she would be promoted (assuming the commander recommended him/her), and so the promotion rate in that job would be 100 percent. (2) Each year, the Air Force selects some critically manned career fields to receive an extra five percentage points. So, if the overall promotion rate was 20 percent, some critically-manned career fields would be allowed to promote 25 percent of their eligible's. When determining who gets promoted, the Air Force uses WAPS (Weighted Airman Promotion System) points. Quite simply, if the promotion rate is 10 percent, you add up the WAPS points, and the top 10 percent of the eligible members in that job with the most WAPS points, are the ones who get promoted. For complete details about the Air Force enlisted promotion system, see Air Force Enlisted Promotion System Made Simple. During times of conflict, the promotion rates increase significantly as the operational tempo of the Air Force airmen also increases. Historical trends both up and down can be seen below in the 25 plus year historical analysis of the promotion rates on E5 ranks in the Air Force. Most recently, the selection rate has been significant after a lag in promotion due to reduced force numbers in Iraq and Afghanistan in 2015. The reduction in deployment cycles often cause a need for fewer airmen thus the drop from mid 40% acceptance rates to low 30# rates. 2015 - 39,260 promotion eligible senior airmen, selected 13,269 for promotion to staff sergeant, for a 33.8% selection rate. 2014 - 36,739 senior airman eligible for promotion to staff sergeant, 9,403 were selected, for a 25.59% selection rate. 2013 - 34,078 senior airmen eligible for promotion to staff sergeant, 11,212 were selected, for a 32.9% selection rate. 2012 - 33,500 senior airmen eligible for promotion to staff sergeant, more than 13,400 senior airmen selected, that is 40% of those eligible. 2011 - 26,549 eligible senior airman for promotion to staff sergeant,11,337 were selected, for a selection rate of 42.70%. 2010 - 28,510 eligible senior airmen for promotion to staff sergeant, 13,518 were selected, for a selection rate of 47.41%. Notice the chart below with the ending of the first Gulf War, a massive reduction in military personnel across the board leads to one of the fewest selection percentages in recent history. However, notice post September 11, 2001. The acceptance of airmen to advance to E-5 nearly doubles. The Army, Navy, Marines and Coast Guard base their enlisted promotion rates based upon a member's job. In other words, promotion rates are different for each job, depending on how many available "slots" there are in the next grade. That means that for over-manned jobs, it is very hard to get promoted, while people in undermanned jobs may be promoted much faster than the service-wide average. However, similar selection rates occur within the other services largely due to times of conflict and times of down sizing.